The money saving deals and amazing dive trips just keep coming. 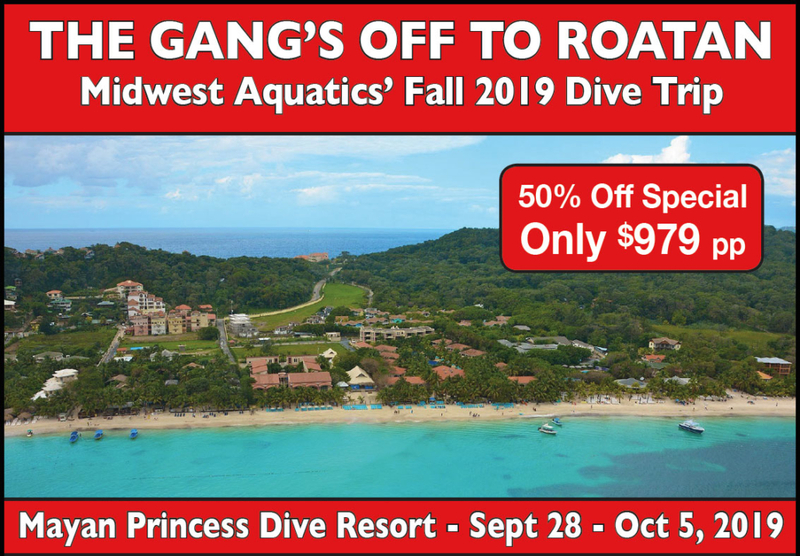 Midwest Aquatics is at it again with incredible savings to you as they venture out to Roatan, Bay Islands. Mayan Princess – An incredible location on the world-famous West Bay Beach. Relax by their signature Mayan pool with waterfalls and secluded Jacuzzi. Indulge at their 4 restaurants with á la carte & buffet style menus as well as unlimited premium drinks including domestic & international liquors, beers & wines making for an unforgettable exotic journey. Part of the second largest barrier reef in the world, the Mesoamerican Barrier Reef, the island of Roatan features vibrant coral, multicolored tropical fish, sponges as big as refrigerators and pelagic species such as manta rays and sea turtles. 5 days of 3 tank boat dives plus 1 night dive. Airfare, gratuities, rental gear and personal items, and Marine Park Fee.